Plot: A Gulf war veteran is wrongly sent to a mental institution for insane criminals, where he becomes the object of a Doctor’s experiments, and his life is completely affected by them. Story: The Jacket starts when 27-year-old soldier Jack (Brody) in Iraq gets hot and killed in action, well so he thought. One year later he ends up inside a mental institute for a murder he doesn’t remember committing. Jack gets put through an extreme treatment program which leads to him being locked up in a straitjacket in the morgue. When he awakes he finds himself wondering around the streets picked up by Jackie Price (Knightley) who just so happens to be the very little girl he met 15 years earlier on the day of the murder he is meant to have committed. Somehow he has travelled through time ten years and now Jack finds himself time hopping between time periods trying to put the pieces together and prevent his own death. The Jacket gives us a time travel film that has to have certain comparison to Jacob’s Ladder, but not for the good reasons. We have a war veteran that gets stuck in a time hop where he can learn to change his present after visiting the future. He wants to change the world for the people who help him but ultimately he would like to save his own life. I see a lot of issues with this story, mainly the reason he gets locked up never gets solved or changed if he can change time. I also found the random time hop never really made sense because we never learn how it happens. There are plenty of holes that need filling in this one as it just doesn’t capture the idea of what it is trying to do. Adrien Brody: Jack Starks is the Gulf war veteran who gets wrongfully locked up in a mental institute, while in there he goes through extreme treatment that leads to him going into the future where he must figure out a way to prevent his own death in the past. Adrien is good but doesn’t reach all the levels we know he is capable of. Keira Knightley: Jackie Price is the young lady Jack meets when he goes into the future, he met a younger version of her in 1992 but in the future she must work with him to uncover what really happened with his death in the past. Keira gives us a good supporting performance without being anything special. Kris Kristofferson: Dr Becker is the controversial Doctor at the institute, he uses methods that are against any ethical code and his patient getting the newest amount of his treatment is Jack. Kris is good as this doctor but we would like to see a lot more from his character. Jennifer Jason Leigh: Dr Lorenson is another doctor at the hospital, she sees that not everything is running the way it should and understands that Jack isn’t as mental ill as the rest believe him to be. She is working on a private case which Jack ends up becoming a key part of. Jennifer gives us a strong supporting performance. Support Cast: The Jacket has a good supporting cast without being too involved with Daniel Craig really stealing most scenes. Director Review: John Maybury – John doesn’t give us the best time travel like thriller that keeps us wondering without giving us all the answers. Horror: The Jacket puts us into the horror of not knowing what is going on with his mind-set. Mystery: The Jacket does try to keep you guessing through the film without giving us much hope of getting anything right. Sci-Fi: The Jacket gives us a time travel idea without ever looking into what is happening in depth. Settings: The Jacket doesn’t give us any stand out settings, we have moments in the mental institute otherwise it is just random outside locations. Special Effects: The Jacket has good effects when needed. Best Part: Locked up scenes are good. Worst Part: Slightly too confusing. Overall: Time travel like film that is filled with confusing and plenty of unanswered questions. Plot: A boy blackmails his neighbour after suspecting him to be a Nazi war criminal. Story: Apt Pupil starts with high school student Todd Bowden (Renfro) who takes notice of an elderly man Kurt Dussander (McKellen) who he suspects of being a Nazi war criminal. Todd uses his upper hand of knowing who Kurt is by blackmailing him into helping learn about what really happened during the war. As the conversations become a regular occurrence Todd’s parent Monica (Dowd) and Richard (Davison) want to meet him but Todd is dealing with his own nightmares. The deeper the two get involved in the stories we get to see the darker side of Kurt but more worryingly we see Todd start to become psychotic. Support Cast: Apt Pupil has a supporting cast that includes Todd’s parents, family and teachers each one noticed a change in him in different ways. Tagline: If you don’t believe in the existence of evil, you’ve got a lot to learn. Trivia: The movie is based on a novella (a long short story) by Stephen King from a book of short stories called “Different Seasons” which also includes “The Body” which becameStand by Me (1986) and “Rita Hayworth and Shawshank Redemption” which became The Shawshank Redemption (1994). Overall: A thriller that keeps you guessing. 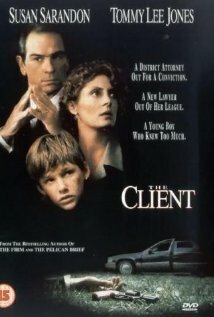 This is a John Grisham adaptation which follows a young boy Mark Sway (Brad Renfro) who witness a suicide of a Mafia lawyer. He is being hunted by the FBI who want him to testify against the Mafia while the Mafia are after him to stop him talking about a murder they have committed. He hires small time lawyer Reggie Love (Oscar Nominated Susan Sarandon) to help protect him and his family. In what is quite a tense thriller that can be considered similar to a lot of other Grisham material that are all very watchable. Put in the all star cast of Tommy Lee Jones, William H Macy, Anthony LaPaglia, Mary-Louise Parker, J.T.Walsh, Will Patton, Kim Coates, Ossie Davis. You get a some very solid acting performances.